Make this superb Star Wars print a part of your plan of attack! Canvas giclee features concept art from legendary artist Ralph McQuarrie. The Plan of Attack Canvas Giclee is limited to just 25 pieces worldwide! Pictures Admiral Ackbar, Mon Mothma, Nien Numb, Lando Calrissian, Luke Skywalker, Princess Leia, Han Solo, Chewbacca, R2-D2, and more. Order this one-of-a-kind collectible Star Wars print now! Make this superb Star Wars print a part of your plan of attack! Tensions run high in the command center as Admiral Ackbar and Mon Mothma detail their plans to bring down the Empire, once and for all. The Plan of Attack Canvas Giclee also pictures Nien Numb, Lando Calrissian, Luke Skywalker, Princess Leia, Han Solo, Chewbacca, R2-D2, and more. 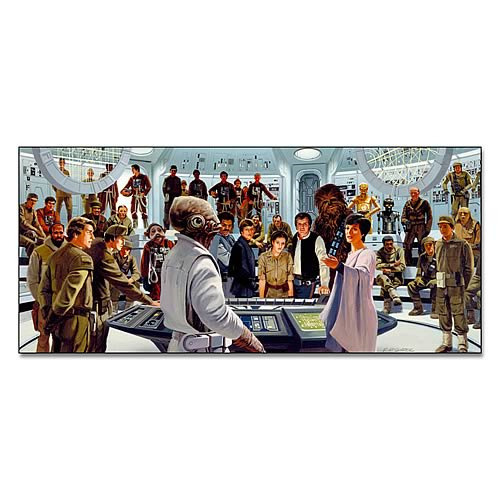 This large giclee on canvas features artwork from legendary Star Wars artist Ralph McQuarrie. It measures 18-inches tall x 40-inches wide, is limited to just 25 hand-numbered pieces worldwide, and includes a certificate of authenticity. Order this one-of-a-kind collectible Star Wars print now!